WASHINGTON — An FBI investigation and congressional probes into the Trump campaign and contacts with Russia continue to shadow the administration, each new development a focus of White House press briefings and attention on Capitol Hill. President Donald Trump has dismissed the story as “fake news” and raised allegations of politically inspired spying by the Obama administration, but the investigations show no sign of abating anytime soon. A Senate Judiciary subcommittee says it will hear testimony in May from former acting attorney general Sally Yates, who was fired in the early days of the Trump administration, and James Clapper, the former director of national intelligence under President Barack Obama. The May 8 open hearing will be the first opportunity for the public to hear Yates’ account of her role in the firing of Trump’s first national security adviser, Michael Flynn. Separately, leaders of the House Committee on Oversight and Government Reform say Flynn appeared to violate U.S. criminal law when he failed to seek permission for or inform the government about accepting tens of thousands of dollars from Russian organizations after a trip there in 2015. Flynn’s lawyer said in a statement that Flynn disclosed the trip in conversations with the Defense Intelligence Agency, where he was its former director. FBI Director James Comey told Congress in March that a federal investigation examining Russian interference in the presidential election, and potential coordination between Russia and the Trump campaign, began in late July. The counterintelligence investigations like this one that examine the operations of foreign intelligence services on U.S. soil are heavily classified, historically time-consuming and rarely result in criminal charges. It’s not clear when this one will end or whether anything criminal will be found, though Comey has said the investigation is being done with an eye on whether any laws were broken. The House probe has been riven with discord. 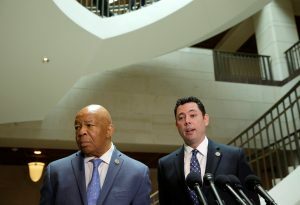 Devin Nunes, the top Republican on the committee who reported meeting with a secret source at the White House to review classified material that he said indicated that communications of Trump associates were captured in “incidental” surveillance of foreigners, recused himself in April from the investigation. Meanwhile, Justice Department officials have scrutinized the business dealings of Paul Manafort, who resigned in August as Trump’s campaign chairman. The Associated Press has reported that Manafort worked for Russian billionaire Oleg Deripaska in 2005 and proposed an ambitious plan to promote the interests of “the Putin government” and undermine anti-Russian opposition across former Soviet republics. Trump has sought to dismiss the story as “fake” and has countered with his own allegations of politically motivated spying by the Obama administration. The White House has also tried to publicly minimize the contributions either to the campaign or administration of some of the individuals whose names have surfaced as part of the investigation, such as Manafort and Flynn. In an interview with MSNBC, Susan Rice, Obama’s national security adviser, acknowledged that she had sometimes asked for the names of Americans who were referenced in intelligence reports, but denied that she or anyone else in the administration had used those reports for political intelligence purposes. Trump said the following day that he believed Rice had committed a crime.